The Index opened weak and went on to touch the lows at 8219, the responsive buyer took control from thereon to move the index back in green and above 8300 only to see the seller back. The index unable to sustain the highs, closed weak at 8239.75, loss of 45.85 points. The broader market though was positive, with 849 advances to 636 declines. Range as per Option Table for expiry is 8200-8400. Call option 8200-8400 added huge 16.46 lacs OI with profit booking seen at 8500 and above strike prices. 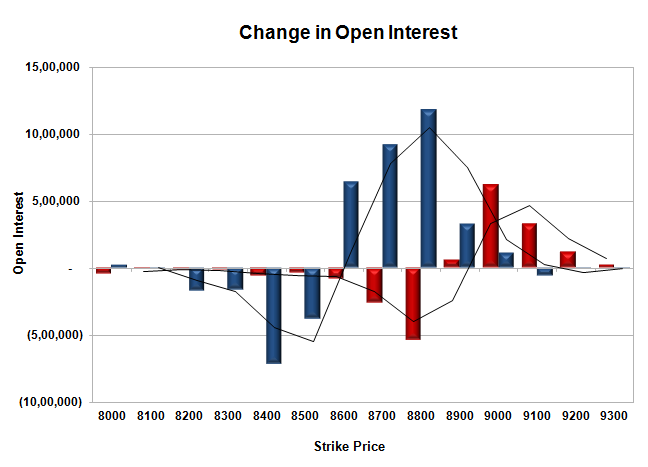 Put option 8200 added 5.43 lacs OI with short covering seen at 8300 and above strike prices. Nifty Open Interest is at 1,10,24,125 down by 31,29,025, whereas May series added 43.19 lacs with decrease in price, most probably 100% rollover with huge short build-up. Bank Nifty Open Interest is at 10,65,375 down by 2,08,150, whereas May series added 3.02 lacs with small increase in price, most probably 100% rollover with huge long build-up. FII’s sold 2.25 lacs Futures, which includes 34369 contracts long build-up and 43375 contracts short build-up, with increase in net OI by 77744 contracts (includes 249236 longs to 258242 shorts for the day) and the Average Price comes to 8391.19. 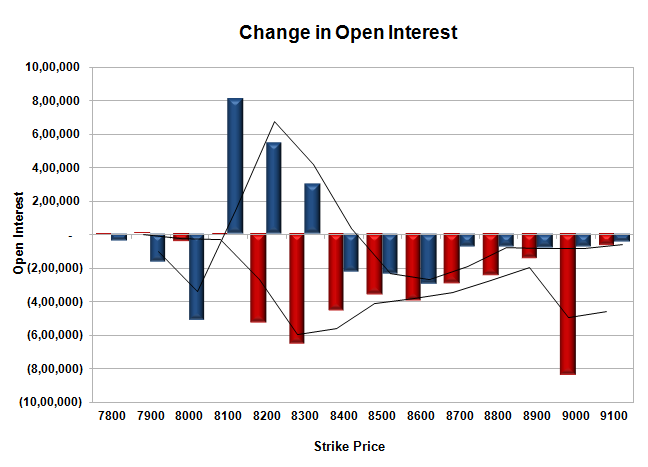 FII’s Index future open contract as on date is 564980 Longs to 297306 Shorts, net long 267674 down by 9006 contracts. Initial and best support at 8200, with highest OI of 57.01 lacs and below that at 8100 with OI of 36.45 lacs. Initial resistance at 8300, with OI of 43.78 lacs and above that at 8400 with huge OI of 46.68 lacs. 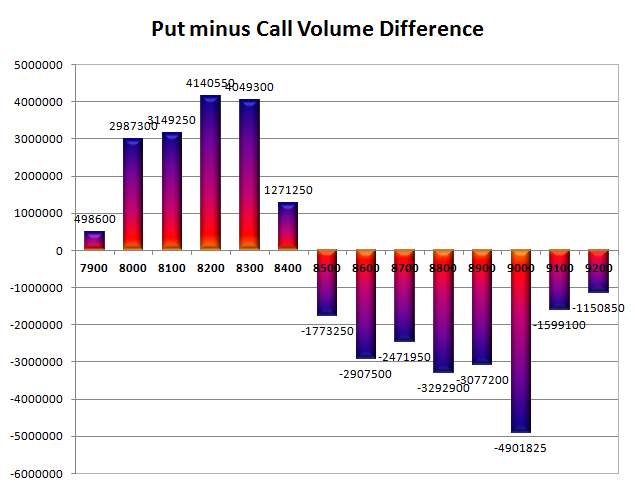 Day Range as per Option Table is 8164 - 8341 and as per VIX is 8165 - 8314 with 8256 as the Pivot. The Index opened flat and stayed positive but saw a few dips towards 8200 which were bought with ease and a final short covering rally saw Nifty cross 8300 but settled a bit lower at 8285.60, still a huge gain of 71.80 points. The broader market was also strong, with 998 advances to 499 declines. Range as per Option Table is 8100-8500. 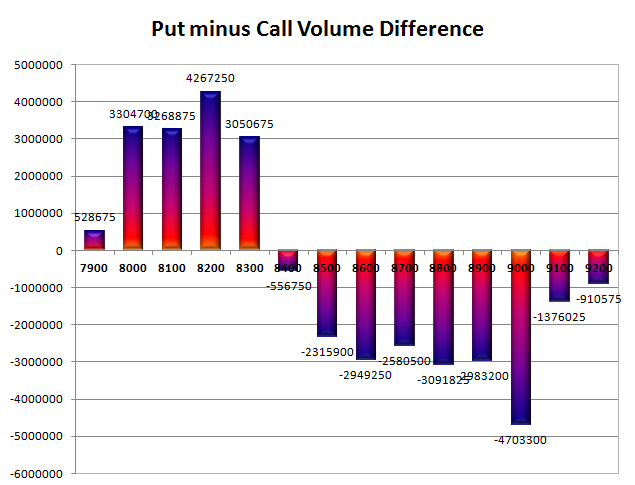 Call option for a change did not any OI but saw huge short covering at 8400 and below strike prices. 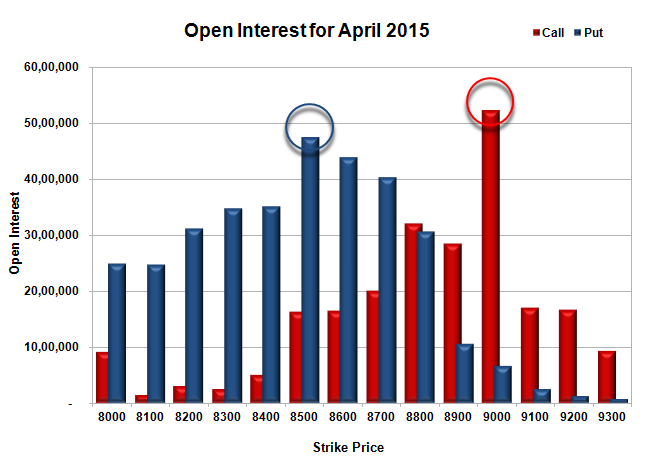 Put option 8300-8100 added huge 16.51 lacs OI with short covering seen at 8400 and above strike prices. Nifty Open Interest is at 1,41,53,150 down by 34,98,425, whereas May series added 37.41 lacs with increase in price, most probably 100% rollover with some long build-up. Bank Nifty Open Interest is at 12,73,525 down by 3,72,350, whereas May series added 1.97 lacs with increase in price, most probably rollover with huge short covering. FII’s sold 5.56 lacs Futures, which includes 7314 contracts long liquidation and 14925 contracts short build-up, with increase in net OI by 7611 contracts (includes 255206 longs to 277445 shorts for the day) and the Average Price comes to 8431.90. FII’s Index future open contract as on date is 530611 Longs to 253931 Shorts, net long 276680 down by 22239 contracts. Initial and best support at 8200, with highest OI of 51.58 lacs and below that at 8100 with OI of 44.68 lacs. Initial resistance at 8400, with OI of 40.19 lacs and above that at 8500 with huge OI of 46.94 lacs. 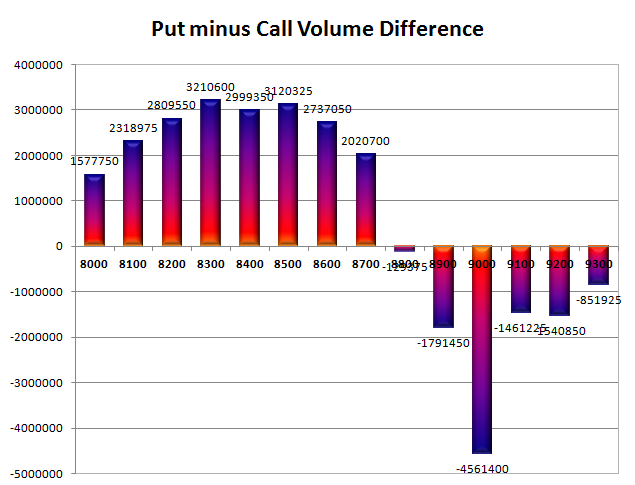 Day Range as per Option Table is 8175 - 8361 and as per VIX is 8210 - 8361 with 8260 as the Pivot. The Index opened positive but saw sell-off from the onset, with each small segment of upmove sold with double the force. The index ultimately closed near the lows at 8213.80, a huge loss of 91.45 points. The broader market was also weak, with just 246 advances to 1277 declines. Range as per Option Table is 8100-8500. Call option 8200-8400 added huge 41.40 lacs OI with profit booking seen at 8600 and above strike prices. 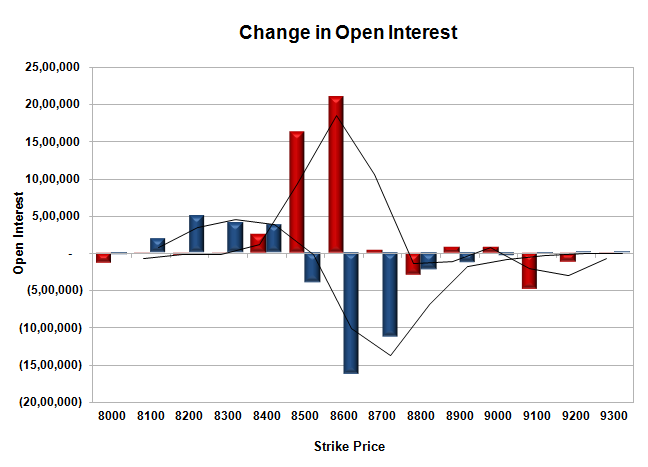 Put option 8100-7900 added 3.65 lacs OI with short covering seen at 8300 and above strike prices. Nifty Open Interest is at 1,76,51,575 down by 19,00,125, whereas May series added 26.95 lacs with decrease in price, most probably 100% rollover with huge short build-up. Bank Nifty Open Interest is at 16,45,875 down by 1,69,450, whereas May series added 1.71 lacs with decrease in price, most probably 100% rollover. FII’s sold 4.80 lacs Futures, which includes 12196 contracts long liquidation and 7002 contracts short build-up, with decrease in net OI by 5194 contracts (includes 179190 longs to 198388 shorts for the day) and the Average Price comes to 8290.61. 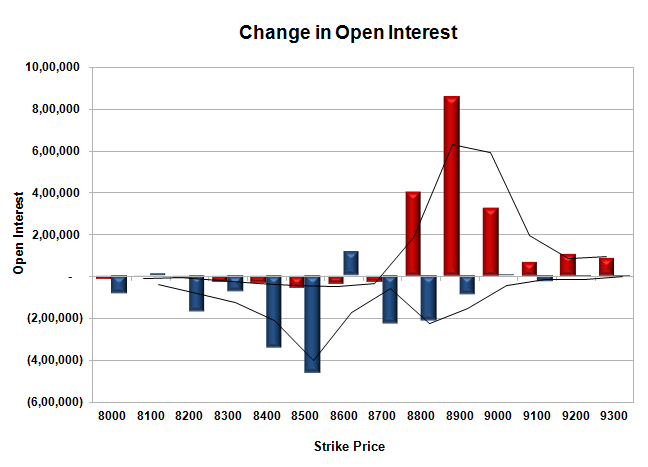 FII’s Index future open contract as on date is 537925 Longs to 239006 Shorts, net long 298919 down by 19198 contracts. Initial and best support at 8200, with OI of 46.14 lacs and below that at 8100 with OI of 36.61 lacs. Initial resistance at 8300, with huge OI of 41.92 lacs and above that at 8400 with OI of 44.79 lacs. Day Range as per Option Table is 8146 - 8334 and as per VIX is 8133 - 8294 with 8250 as the Pivot. The Index opened flat to positive above 8405 but saw huge selling pressure from the morning itself to make new lows with each hour, making a low of 8273. A small short covering towards the end saw the index close just above 8300 at 8305.25, still a huge loss of 93.05 points. The broader market was also weak, with just 235 advances to 1287 declines. Range as per Option Table is 8200-9000. Call option 8200-8400 added huge 18.62 lacs OI with profit booking seen at 8800 and above strike prices. 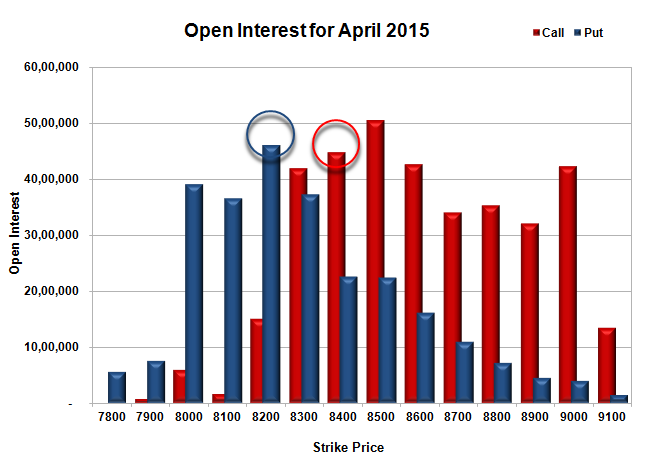 Put option 8200-8000 added 7.86 lacs OI with short covering seen at 8400 and above strike prices. Nifty Open Interest is at 1,95,51,700 down by 8,24,425, whereas May series added 3.83 lacs with decrease in price, most probably some rollover with huge long liquidation. Bank Nifty Open Interest is at 18,15,325 up by 14,325, whereas May series added 1.08 lacs with decrease in price, most probably huge short addition in both series. FII’s sold 6.75 lacs Futures, which includes 19816 contracts long liquidation and 7168 contracts short build-up, with decrease in net OI by 12648 contracts (includes 53257 longs to 80241 shorts for the day) and the Average Price comes to 8435.99. FII’s Index future open contract as on date is 550121 Longs to 232004 Shorts, net long 318117 down by huge 26984 contracts. 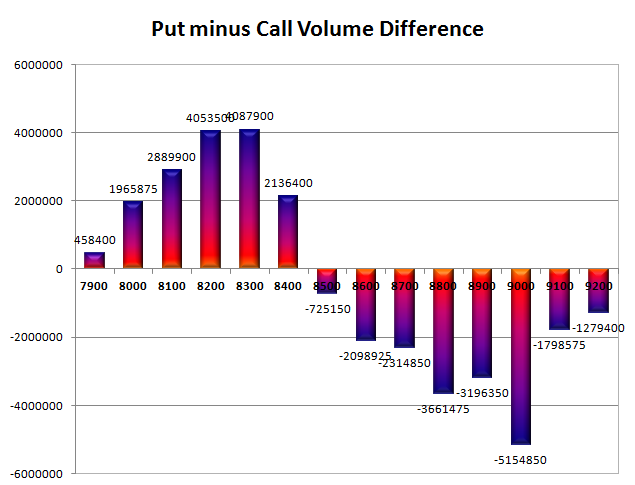 Initial and best support at 8300, with OI of 50.45 lacs and below that at 8200 with OI of 47.89 lacs. Initial resistance at 8400, with huge OI addition of 8.46 lacs and above that at 8500 with OI of 51.11 lacs. 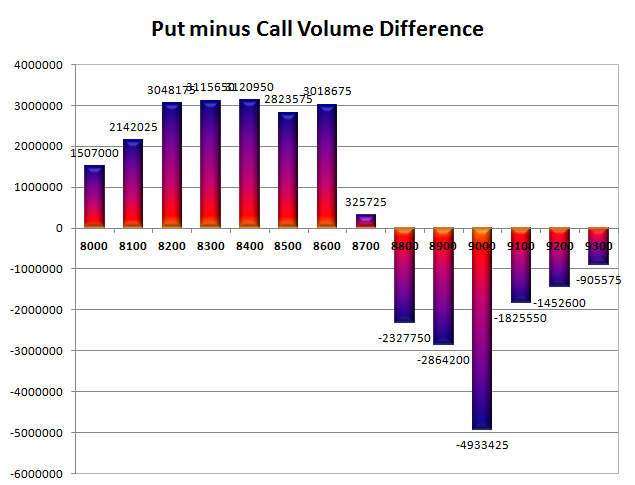 Day Range as per Option Table is 8229 - 8417 and as per VIX is 8225 - 8386 with 8331 as the Pivot. The Index opened positive above 8478 and went on to touch the highs of the day at 8505. The sellers used the opportunity to move the index to lows at 8362 but closed just above at 8398.30, loss of 31.40 points. The broader market was also negative, with 700 advances to 809 declines. Range as per Option Table is 8200-9000. Call option 8300-8500 added 9.49 lacs OI with profit booking seen at 8600 and above strike prices. Put option 8400-8200 added huge 13.43 lacs OI with short covering seen at 8500 and above strike prices. 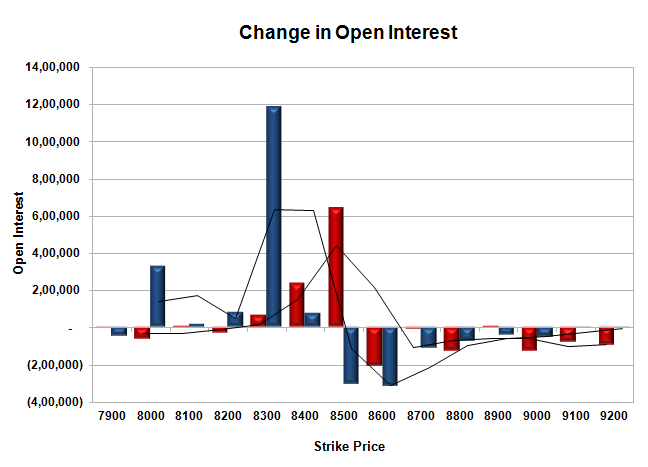 Nifty Open Interest is at 2,03,76,125 down by 9,35,100, with decrease in price, most probably huge long liquidation. Bank Nifty Open Interest is at 18,01,000 down by 1,00,725, with small decrease in price, most probably huge long liquidation. FII’s sold 7.23 lacs Futures, which includes 23971 contracts long liquidation and 4948 contracts short build-up, with decrease in net OI by 19023 contracts (includes 49400 longs to 78319 shorts for the day) and the Average Price comes to 8564.64. FII’s Index future open contract as on date is 569937 Longs to 224836 Shorts, net long 345101 down by huge 28919 contracts. Initial support still at 8400, with OI of 39.58 lacs and below that at 8300 with OI of 52.70 lacs. Initial resistance at 8500, with huge OI of 51.77 lacs and above that at 8600 with OI of 48.22 lacs. 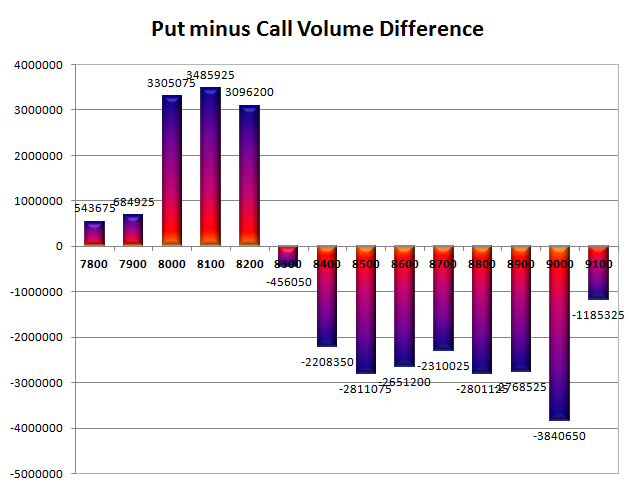 Day Range as per Option Table is 8324 - 8508 and as per VIX is 8317 - 8480 with 8422 as the Pivot. The Index opened positive above 8400 and after staying within a range with positive bias saw huge selling pressure to the lows of the day at 8284.70. The responsive buyer took control from thereon to move the index back in green and close near the highs at 8429.70, gain of 51.95 points. The broader market though was negative, with 711 advances to 789 declines. Range as per Option Table is 8200-9000. Call option 8300-8600 added huge 17.31 lacs OI with profit booking seen at 8700 and above strike prices. 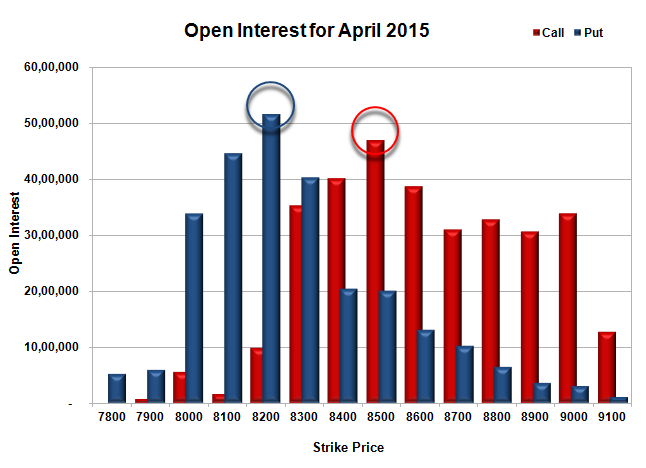 Put option 8200-7900 added huge 10.08 lacs OI with short covering seen at 8300 and above strike prices. 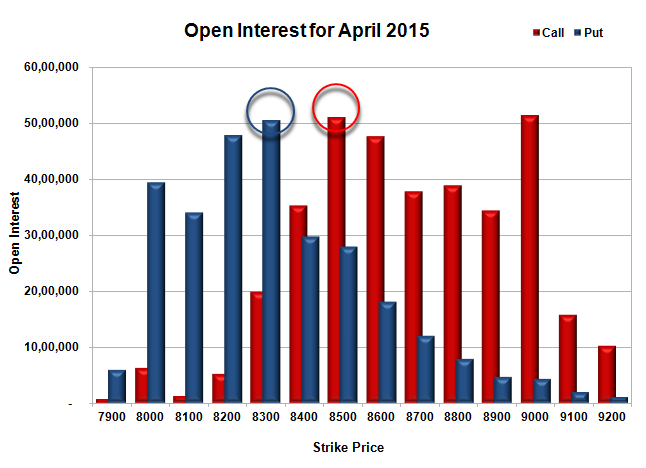 Nifty Open Interest is at 2,13,11,225 down by 1,54,100, with increase in price, most probably short covering. 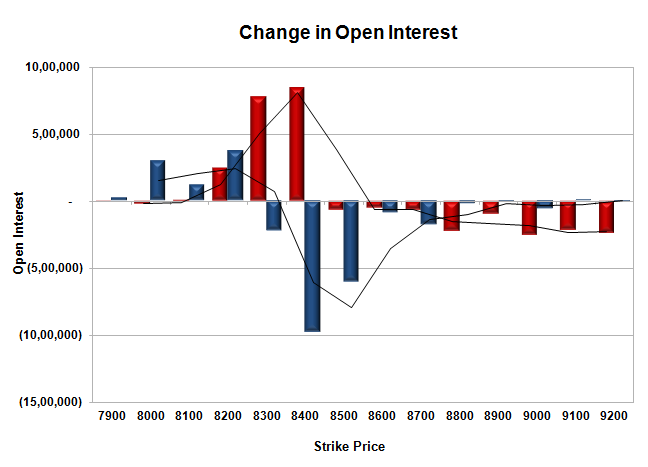 Bank Nifty Open Interest is at 19,01,725 down by 51,825, with increase in price, most probably short covering. FII’s sold 0.33 lacs Futures, which includes 5605 contracts long build-up and 6913 contracts short build-up, with increase in net OI by 12518 contracts (includes 81754 longs to 83062 shorts for the day) and the Average Price comes to 8606.18. 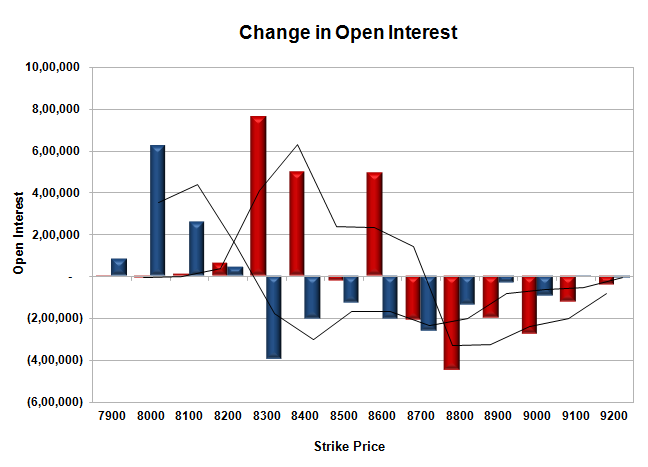 FII’s Index future open contract as on date is 593908 Longs to 219888 Shorts, net long 374020 down by 1308 contracts. Initial support still at 8400, with OI of 38.82 lacs and below that at 8300 with OI of 40.85 lacs. Initial resistance at 8500, with OI of 45.34 lacs and above that at 8600 with huge OI of 50.28 lacs. 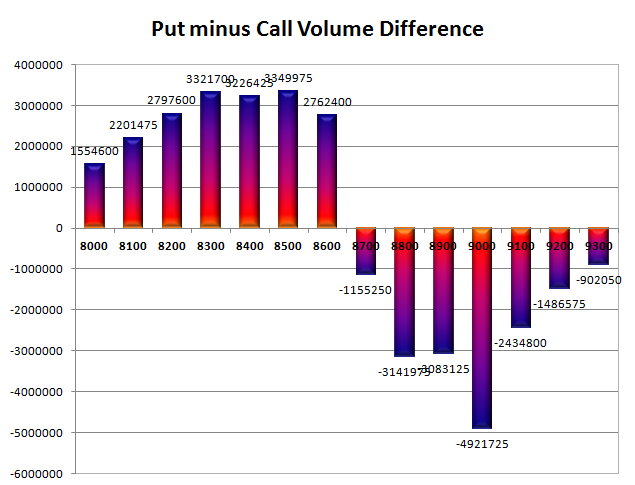 Day Range as per Option Table is 8310 - 8492 and as per VIX is 8354 - 8506 with 8388 as the Pivot. The Index opened negative just above 8400, but saw a dip below the same within the first few minutes of trade. The index then stayed in a narrow range with neutral bias but saw huge sell-off in the last hour to close weak at 8377.75, a huge loss of 70.35 points. The broader market was weak, with 629 advances to 854 declines. Range as per Option Table is 8300-9000. 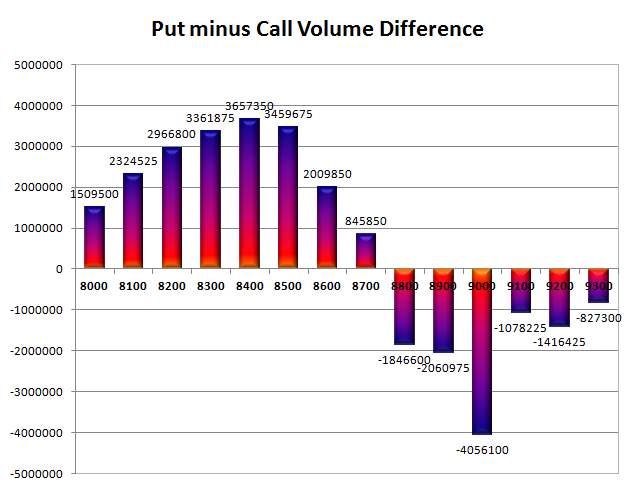 Call option 8300-8600 added huge 31.32 lacs OI with profit booking seen at 8700, 8900 and above strike prices. 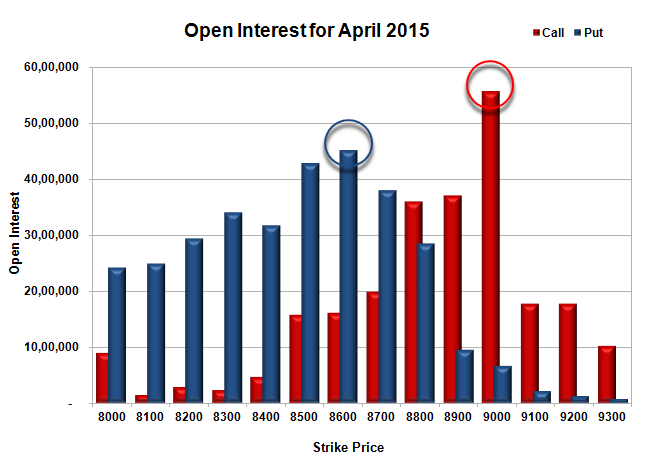 Put option 8400-8000 added huge 21.15 lacs OI with short covering seen at 8500 and above strike prices. 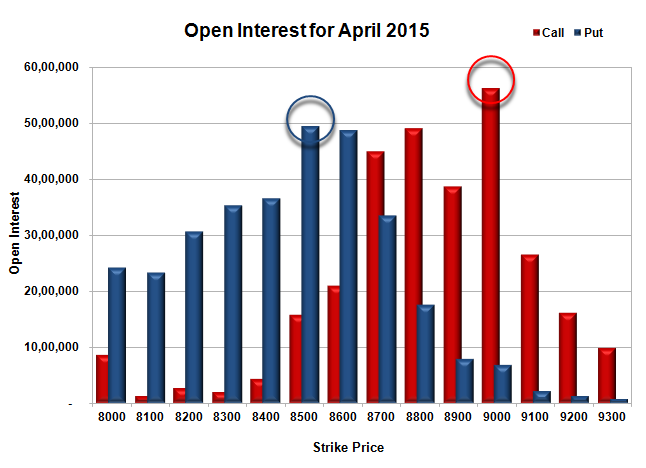 Nifty Open Interest is at 2,14,65,325 up by 10,30,900, with decrease in price, most probably huge short build-up. 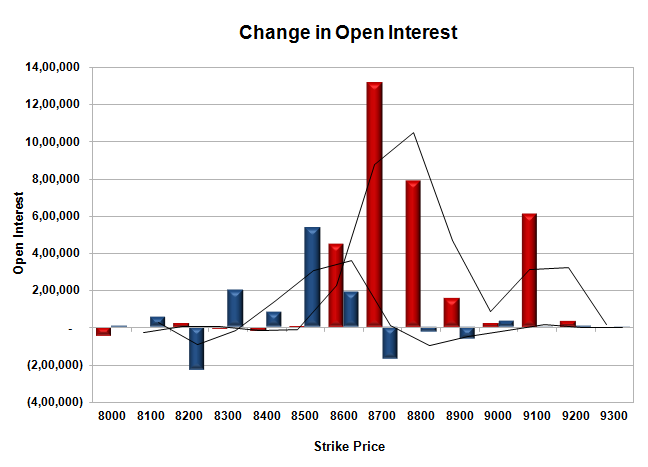 Bank Nifty Open Interest is at 19,53,550 down by 5,675, with not much change in price, most probably short covering. FII’s bought 3.54 lacs Futures, which includes 39074 contracts long build-up and 24934 contracts short build-up, with increase in net OI by 64008 contracts (includes 102954 longs to 88814 shorts for the day) and the Average Price comes to 8531.21. FII’s Index future open contract as on date is 588303 Longs to 212975 Shorts, net long 375328 up by 14140 contracts. Initial and very good support still at 8400, with OI of 40.85 lacs and below that at 8300 with OI of 44.80 lacs. Initial resistance at 8500, with OI of 45.58 lacs and above that at 8600 with huge OI of 45.34 lacs. 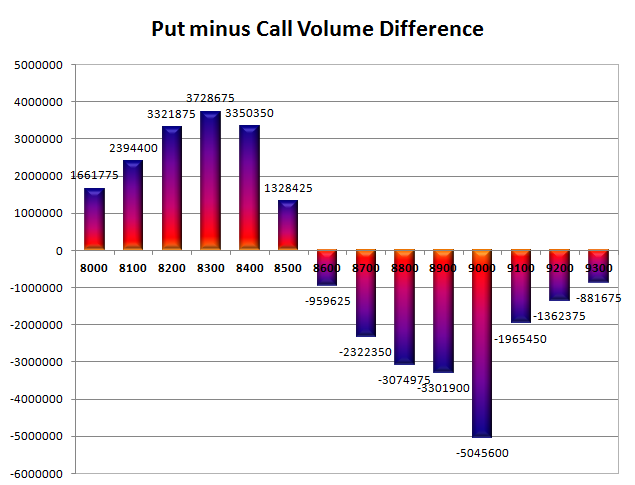 Day Range as per Option Table is 8311 - 8480 and as per VIX is 8303 - 8452 with 8400 as the Pivot. The Index opened flat to positive but saw huge selling pressure from the onset to break one support level after another to close weak at 8448.10, a huge loss of 157.90 points. The broader market was also weak, with 304 advances to 1219 declines. Range as per Option Table is 8300-9000. Call option 8400-8700 added huge 40.06 lacs OI with profit booking seen at 9100 and above strike prices. 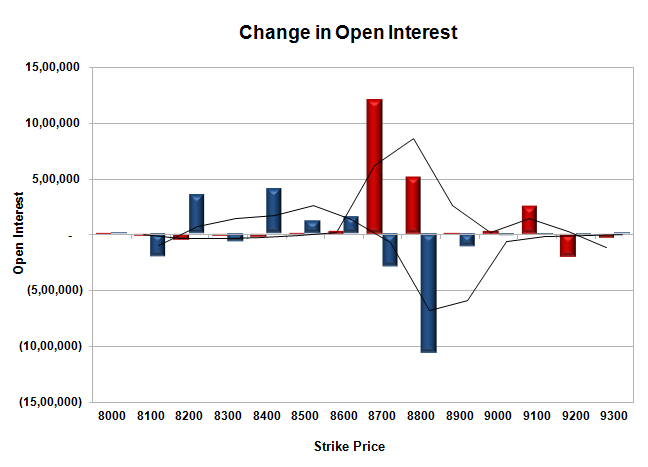 Put option 8400-8100 added 14.64 lacs OI with short covering seen at 8500 and above strike prices. 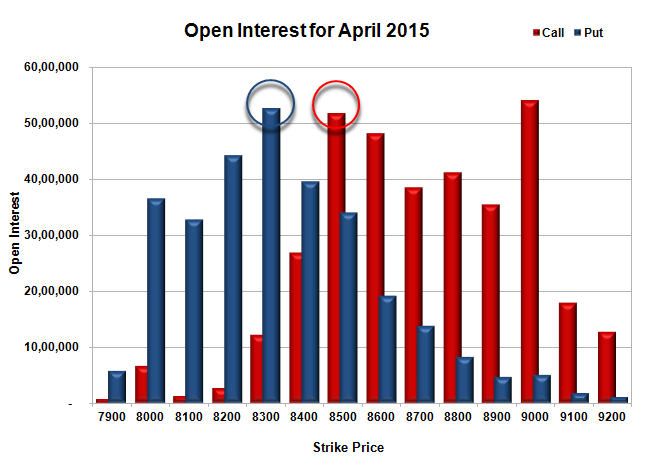 Nifty Open Interest is at 2,04,34,425 down by 49,750, with decrease in price, most probably long liquidation. 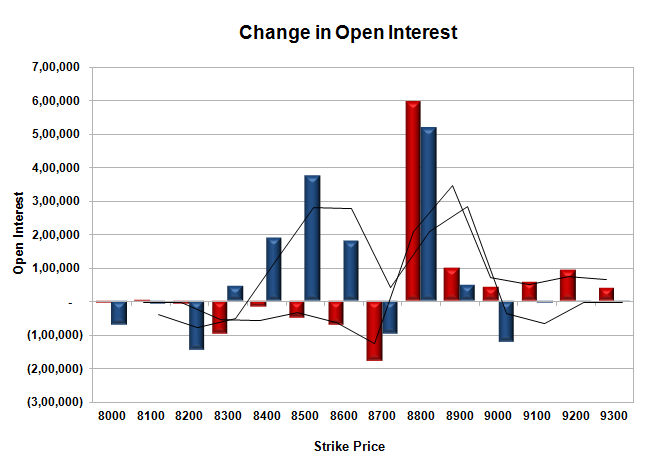 Bank Nifty Open Interest is at 19,59,225 up by 2,07,125, with decrease in price, most probably huge short build-up. FII’s sold huge 15.22 lacs Futures, which includes 57454 contracts long liquidation and 3422 contracts short build-up, with decrease in net OI by 54032 contracts (includes 106406 longs to 167282 shorts for the day) and the Average Price comes to 8635.04. FII’s Index future open contract as on date is 549229 Longs to 188041 Shorts, net long 361188 down by huge 60876 contracts. Initial and very good support at 8400, with OI of 40.33 lacs and below that at 8300 with OI of 39.38 lacs. Initial resistance at 8500, with huge OI addition of 16.20 lacs and above that at 8600 with huge OI of 41.98 lacs. Day Range as per Option Table is 8401 - 8571 and as per VIX is 8376 - 8520 with 8497 as the Pivot. The Index opened flat to positive at 8844.75 but was unable to sustain the highs and stayed in a narrow range with negative bias only to be sold-off huge in the last hour of trade to close near the lows at 8750.20, huge loss of 83.80 points. The broader market was negative, with 646 advances to 884 declines. Developing Range as per Option Table is back to 8300-9000. Call option 8800-9300 added huge 18.52 lacs OI with short covering seen at 8700 and below strike prices. 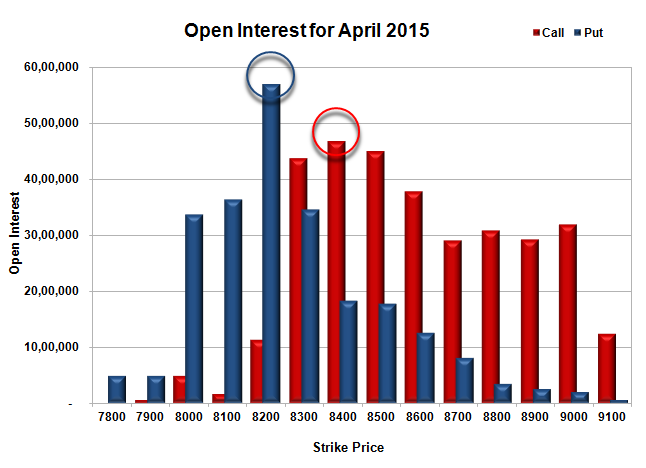 Put option 8600 added 1.17 lacs OI with short covering seen at 8700 and above strike prices. 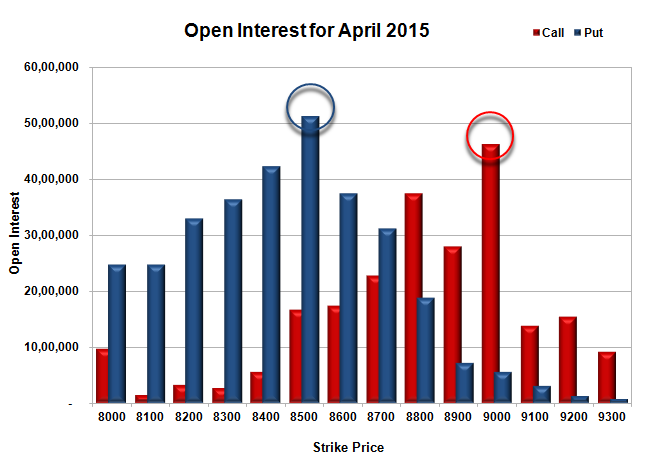 Nifty Open Interest is at 1,94,04,225 up by 6,30,800, with decrease in price, most probably huge short build-up. Bank Nifty Open Interest is at 16,87,450 down by 1,02,600, with decrease in price, most probably long liquidation. FII’s bought huge 8.70 lacs Futures, which includes 35294 contracts long build-up and 483 contracts short build-up, with increase in net OI by 35777 contracts (includes 79817 longs to 45006 shorts for the day) and the Average Price comes to 8820.65. FII’s Index future open contract as on date is 586931 Longs to 144314 Shorts, net long 442617 up by huge 34811 contracts. 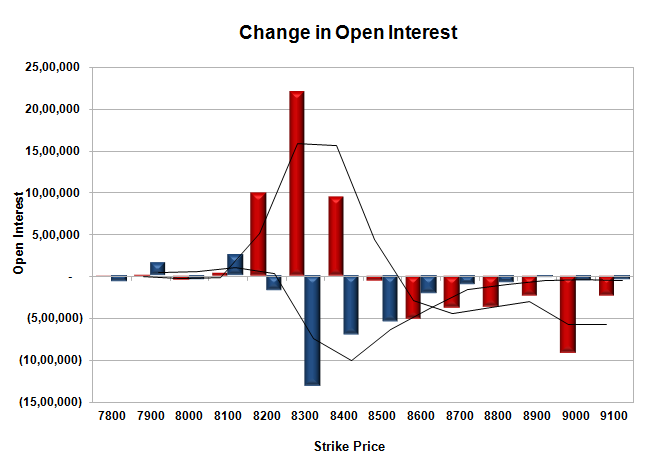 Initial support back at 8700, with OI of 38.07 lacs and below that at 8600 with huge OI of 45.13 lacs. Initial resistance now at 8800, with OI of 36.06 lacs and above that at 8900 with OI of 37.06 lacs. 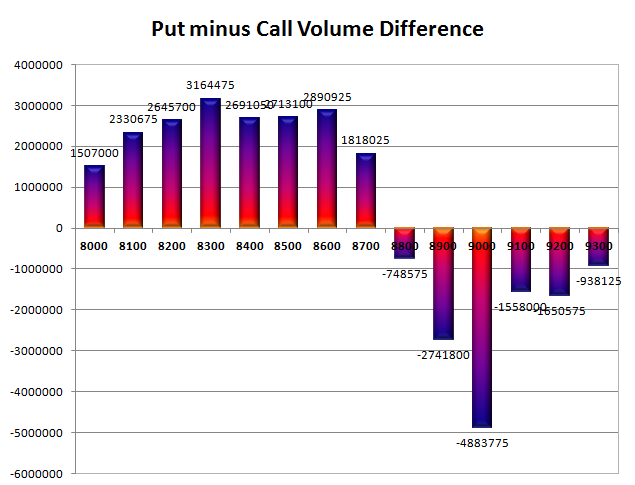 Day Range as per Option Table is 8693 - 8842 and as per VIX is 8683 - 8817 with 8772 as the Pivot. The Index opened positive above 8800 and stayed in a narrow range but saw the buyers back in action in the second half to move the index to the highs of the day at 8841.65 but closed just lower at 8834.00, gain of 53.65 points. The broader market was positive, with 916 advances to 621 declines. Developing Range as per Option Table comes 8500-9000. Call option 8900-9200 added huge 11.20 lacs OI with short covering seen at 8800 and below strike prices. Put option 9000-8600 added huge 31.75 lacs OI with profit booking seen at 8500 and below strike prices. 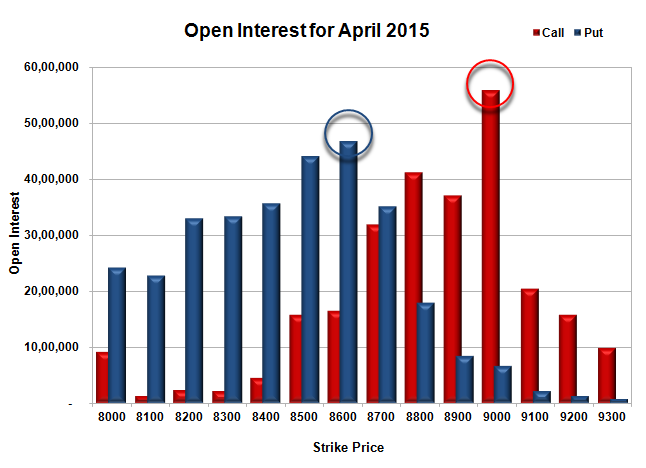 Nifty Open Interest is at 1,87,73,425 down by 3,43,800, with increase in price, most probably short covering. 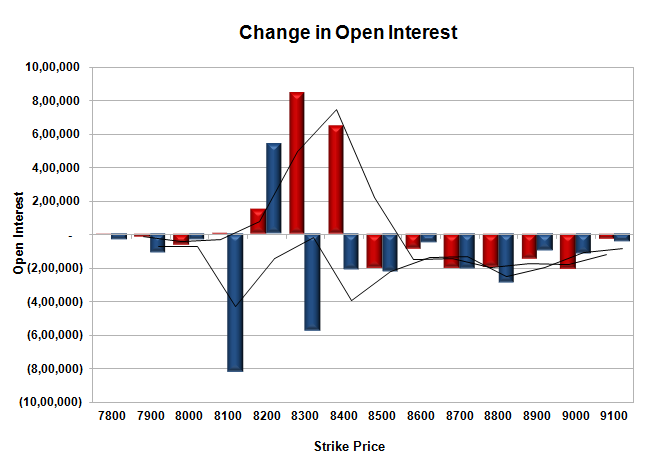 Bank Nifty Open Interest is at 17,90,050 up by 91,575, with no change in price, most probably long/short build-up. FII’s sold 1.39 lacs Futures, which includes 3647 contracts long liquidation and 1914 contracts short build-up, with decrease in net OI by 1733 contracts (includes 41384 longs to 46945 shorts for the day) and the Average Price comes to 8914.40. FII’s Index future open contract as on date is 551637 Longs to 143831 Shorts, net long 407806 down by 5561 contracts. 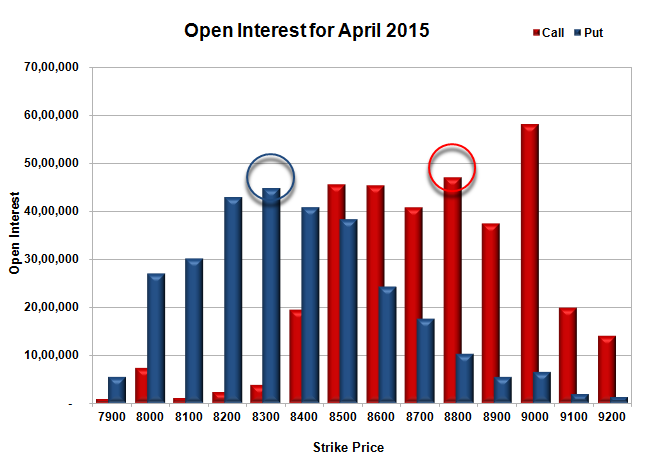 Initial support at 8800, with huge OI addition of 11.80 lacs and below that at 8700 with OI of 40.38 lacs. 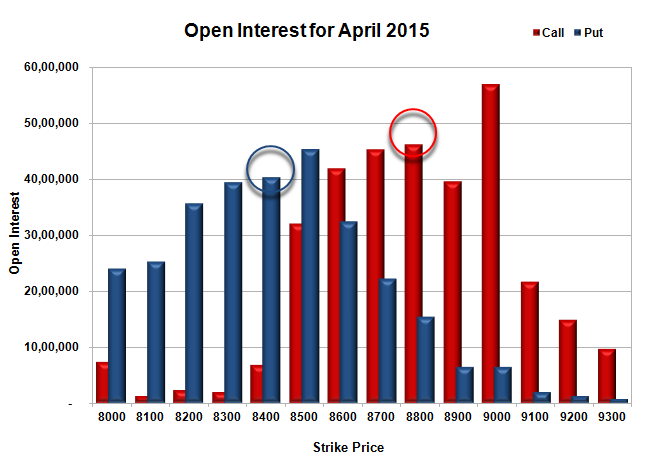 Initial resistance now at 8900, with OI of just 28.48 lacs and above that at 9000 with highest OI of 52.38 lacs. 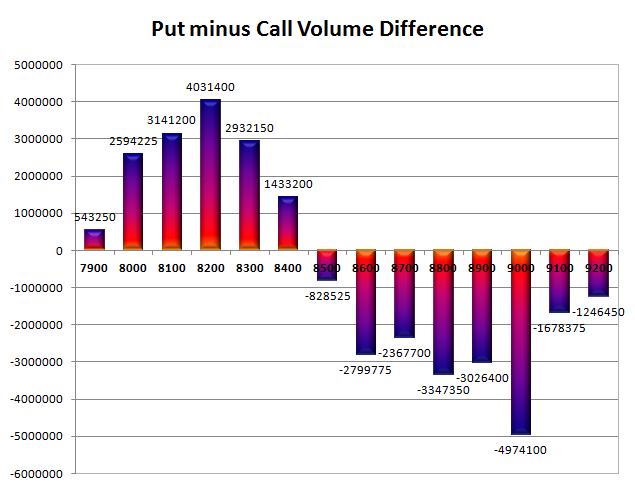 Day Range as per Option Table is 8745 - 8891 and as per VIX is 8767 - 8901 with 8813 as the Pivot. The Index opened flat, stayed in a narrow range with negative bias for the better part of the day but closed just in green at 8780.35, small gain of 2.05 points. The broader market was positive, with 955 advances to 578 declines. Developing Range as per Option Table comes 8400-9000. 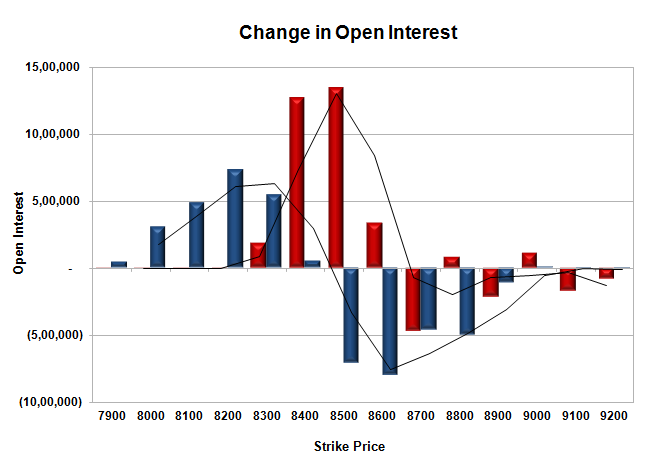 Call option 8800-9200 added 8.90 lacs OI with short covering seen at 8700 and below strike prices. Put option 8800-8400 added huge 11.65 lacs OI with profit booking seen at 8200 and below strike prices. 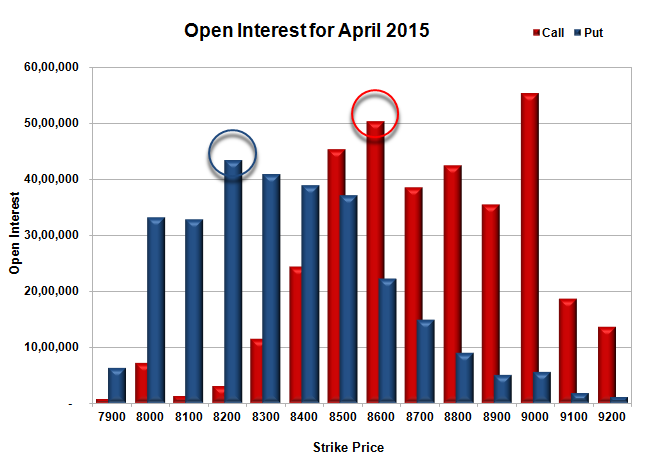 Nifty Open Interest is at 1,91,17,225 up by 42,425, with small increase in price, most probably long build-up. Bank Nifty Open Interest is at 16,98,475 down by 42,175, with decrease in price, most probably long liquidation. FII’s sold 0.92 lacs Futures, which includes 614 contracts long build-up and 4294 contracts short build-up, with increase in net OI by 4294 contracts (includes 26526 longs to 30206 shorts for the day) and the Average Price comes to 8848.02. FII’s Index future open contract as on date is 555284 Longs to 141917 Shorts, net long 413367 down by 3680 contracts. Initial support at 8700, with OI of 31.23 lacs and below that at 8600 with OI of 37.53 lacs. Initial resistance stays at 8800, with OI of 37.39 lacs and above that at 9000 with OI of 46.22 lacs. 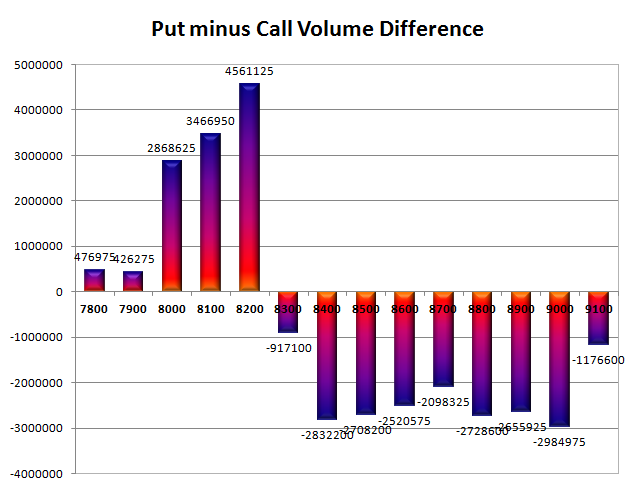 Day Range as per Option Table is 8696 - 8844 and as per VIX is 8715 - 8846 with 8767 as the Pivot.